Nothing to do with G.L. Watson. Everything to do with the River Clyde, which made him. A worthy first ever “re-blog”, and reminder of the fabulous collections and work of University of Glasgow Archive Services (GUAS). 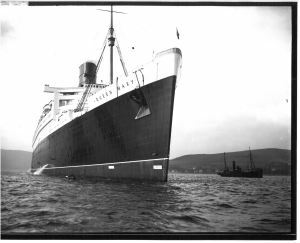 To see the larger photo of Queen Mary at anchor at “The Tail o’ the Bank”, click or tap “View original”. 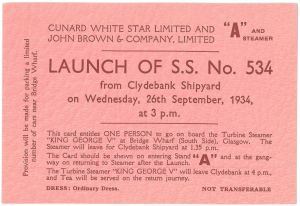 80 years ago today ship number 534, the Cunard White Star Liner built on the river Clyde by John Brown’s shipyard, was launched and given the name RMS Queen Mary. The Queen Mary was one of the most celebrated, and largest, ships of its generation and is one of the best known liners to have sailed the seas. The contract for the building of ‘ship number 534’ was signed on 1st December 1930 and the first keel plates were laid on the 27th of that month. Work halted, however, in December 1931 due to the economic depression and did not begin again until April 1934. The structure was finished within six months and she was ready for launch on 26th September 1934. This entry was posted in archives, Clydebuilt, Firth of Clyde, G.L. Watson, gift, Glasgow, object of desire, River Clyde, ship launch, shipbuilding, shipyards, Uncategorized and tagged Clydebank, Clydebank Shipyard, Cunard, John Brown, otdh, Queen Mary. Bookmark the permalink. Not quite nothing to do with G L Watson (& Co, at any rate), as their design for Nahlin was the preceding build (number 533) to the Queen Mary (534) at John Brown’s yard. Would have been fantastic to see images of both magnificent vessels side-by-side on the ways, but alas it was never to be. Instead we have a remarkable illustration of just how dire things were for the shipbuilding industry during the depression years: John Brown yard no. 533, the G.L. Watson & Co. designed turbine steam yacht Nahlin, was we believe launched in 28 April 1930, commenced trials 2 June, had attended Cowes Week in August and was already in or well on the way to Caribbean waters by the time the contract for the building of yard number 534 (Queen Mary) was signed, on 1st December 1930.